Compared to super speed and mind reading, sixteen–year-old Sketch McGee’s ability to draw the future makes her a pretty lame villain in a family of super-bads. In fact, she’s a clumsy geek just trying to survive high school. When the new guy, Chase Fairway, catches her eye—all that changes. They quickly fall for one another, but her heart is broken when she discovers he’s Zip, the new do-gooder in town flying around mucking up her family’s life of crime. While doodling, she learns she can not only predict the future, but alter it. She has the power to paint Chase into the perfect bad-boy boyfriend she’s always wanted. Armed with Zip by her side, life is going great, until she realizes he’s a whole different kind of bad guy, like murderous psychopath kind of evil. He goes after her father and Sketch is crushed when she learns he’s the guy from her drawings standing over her dad’s lifeless body. Now, she has to find a way to draw a new future or risk watching her father’s death—in real life. SKETCH McGEE, a Young Adult Fantasy novel complete at 65,000 words, is available upon request. There’s something compelling about this, but I’m afraid I’m a little too confused. You might want to pick one name for Chase/Zip and stick to it, and describe his do-gooder personality without going into his superhero name. The line “In fact, she’s a clumsy geek…” coming so close to the beginning of your query, also makes me stop for a sec and wonder if she’s lying or kidding herself about her super-villain family. Zip’s “going after her father” is also confusing — “going after” seems to indicate he attacks, but the image of him standing over her father’s lifeless body is just from a drawing, right? It’s an interesting idea — taking Isaac’s power from “Heroes” and putting it in the hands of a teenager — in a sense, combining the power to draw the future with the actual attempt to change it, with a twist. But as the query is written, it just doesn’t work for me. As a side note, I find that superheroes, like vampires and werewolves, can crowd a list. In my case, for instance, where I already represent two books that feature superheroes, I doubt I have room for a third. How does this help you? Well, ask yourself — do they have to be superheroes? An artist who can draw the future, and suddenly finds she can manipulate it doesn’t need to be a member of a crime family to feel out of place in high school. And Chase can be the perfect-seeming new kid in school without having a secret identity as a crime fighter. I agree, Daphne! Also, the name seems a little forced: Where I live, "sketch McGee" is slang for something that feels sinister or not right. Is that what you want readers to think of when they read your character's name? I also think it might work better if the protagonist is in middle school: it seems like by getting to high school, she would know more about trying to change people and future, as well as being much more secure in being different than her family. Unless it is deliberate that she is behind in this kind of development, she doesn't sound like she could be much older than thirteen or fourteen. The "Life is going great" part also worries me as a reader. Is the middle of this book boring? Does all the action happen at the very end? You also seem to be trying to appeal to both boys and girls, which is always good, but you might be trying so hard to appeal to both that it doesn't work for either one. That's a good point, Daphne. I'd be much more intrigued by the story if it was a girl from a normal family who aren't super-anythings who could draw the future. Anyone who knows me knows that I'm a sucker for ordinary people with extraordinary abilities so I started reading this query with a WOW in my throat! I was sold in the first paragraph and then confused by the second. Is Sketch drawing her father lifeless because it *is* like Heroes and she didn't know what she was drawing until she drew it? You said she can manipulate the future so it seems like a easy fix to just draw her father alive…so that is what confuses me and then kinda kills the conflict. I'm not saying that there isn't a conflict, it's just not conveyed in the query. Personally, I'd love to read this because of the super powers, but like Daphne said, you can maybe broaden it by not making them actual "super heroes" if you find you have a hard time getting agent's attention. Hope that helps! Yaay! That's my query! 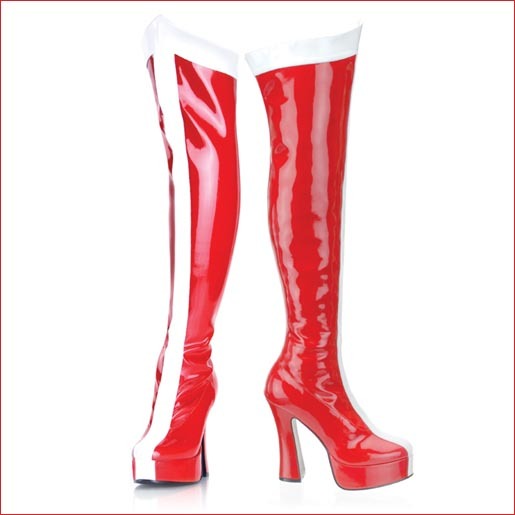 Thanks for the AWESOME boots… Sketch has a pair a LOT like them–her's are black though–she would NEVER be caught in red! Okay, so the family being villains doesn't work you guys say? Hmm, My whole story is kind of based around the fact that they are run of the mill villains and kind of boring, so she draws the do-gooder bad, and then kind of realizes WHOA she doesn't want to be that bad. Her powers are all new to her, too. Is that something I should go over in the query so people understand why she can't just draw everything she loves and be all happy-go-lucky with it all? She uses a device on herself in the middle of the book to kind of ramp up her powers and that's when she starts altering the future with her drawings. See, I have such trouble fitting this into a query–the middle of the book isn't boring because it doesn't take her long to figure out her huge mistake with Chase. Are villains crowding agents lists right now? Is that being overdone because of the whole Dr. Horrible thing? Yikes… that's a huge drawing board I might be headed back to! Okay, Okay–I played with it some… does this portray things any better? Compared to super speed and mind reading, sixteen-year-old Sketch McGee’s ability to draw the future makes her a pretty lame villain in a family of super-bads. It’s all she can do to make it through a day of high school, much less mastermind evil plots. But, everything changes when the new guy, Chase Fairway, steals her heart—which is quickly broken when she discovers he’s the obnoxious new do-gooder in town flying around mucking up her family’s life of crime. Drawing the future turns out not to be so pathetic when she learns she can also shape it however she wants. Goodbye do-gooder, hello perfect bad-boy boyfriend Chase. Life is going great until she figures out he’s a whole different kind of bad guy. Not bank-robbing, diamond-stealing evil, but murderous psychopath evil. Suddenly her drawings of a man standing over her dad’s lifeless body make perfect, horrifying sense. Governed by her emotions and struggling to control her powers, she has to find a way to erase her mistakes and create a new future, or watch her father’s death—in real life. SKETCH McGEE, a YA Urban Fantasy complete at 65,000 words, is available upon request. Thank you for your time, and I look forward to hearing from you. The transition from stealing heart to breaking heart is rough. Could you put the drawing of her father toward the beginning of the query? Maybe something like: The drawing of her father's death was freaking her the freak out. Yeah, that's a weak sentence, but you get the idea. I really like this query and the story sounds very fun. The superhero/super villain angle is what draws me to the story, so I have to disagree that it would be better outside that reality. Maybe it's just what I've read, but the whole kid who has a power in a family of normal people has been done, done, and done again. A book written from the perspective of a super villain seems more unique to me. That said, I think the second query blurb is a lot better. But I would beef up that she has to choose between keeping the love of her life and keeping her father alive, because that answers the question about why she doesn't use her ability to draw away her dad's death. The second version is much stronger, and I think this has some great, hooky bits. Even if there are only so many spots for superheroes out there, I feel like people are still excited to read them, as long as there's a strong story behind the genre elements. What I would be reading this for – and I would read this, from your query – is to see the fallout of her truly awful act of manipulating Chase's future for her own desires, and watching her figure out where she wants to end up on the scale from cartoon super-villainy to genuine evil. I like the second one better but the thing that still gets me is the drawing of her dad dead. It seems to just be dropped in the second paragraph without any explanation about why she is drawing him dead. I also agree with HWPetty. I like the family of “super-bads”. Stories that just have the kid dealing with secrets on their own has been done. I totally agree . . . I think the core conflict you have here is the "love of her life versus fathers life". Her internal battle of justifying both is very interesting. Especially since her father, being super-villan dad and all, has probably done some pretty bad things on his own accord when Chase has only done bad things because she changed him via drawings. I love the voice, and think the second was better, but I agree in making this issue here the hook.